One of a series of profiles of our neighbours, here in Pullens Yards. We love craft: the creative process that involves turning a vision into reality. We craft brands and sign systems. Our neighbours craft pots and buildings, chairs and lutes, paintings and beeswax candles, eaux de cologne and hats. Katty is instantly likable with a smile that lights everything up. She has says her design is "anything but avant-garde", she isn't about to make a "hat made of meat". 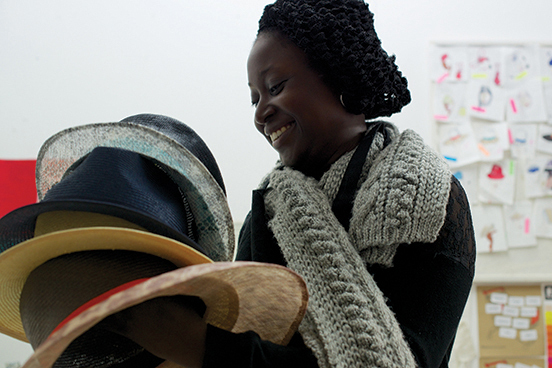 She concentrates on wearable designs, hats that mix with everyday clothes. Her portion of the studio is a blend of atelier and factory - a duality common to the artist-maker. Walls smattered with watercolour sketches and colour-coded notes. Tables like a landscape from a Tim Burton animation; hillocks of cloth samples, behind which porcupines of needles bristle. The floor is given to serious making, chock-a-block with wooden forms over which the cloth is stretched and left to fix a shape. At a glance, it is chaos. But if you look longer you can see how everything has its place in the processes of imagining hats and then physically making them. Behind the sweetness, there is something of a missionary in Katty. 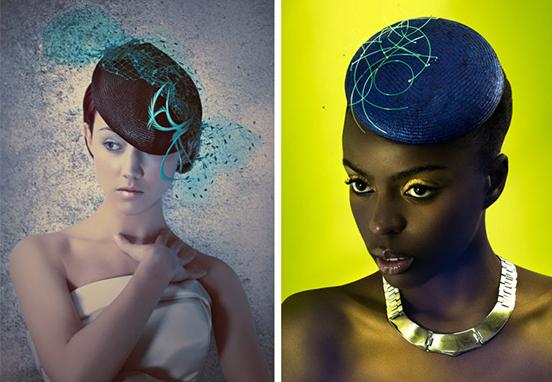 Her designs are playful versions of classic hat types - 'classic with a twist' is a design approach taken by some of the world's most successful designers. Katty is making hats attractive and wearable to make us all wear them. Her deeper purpose is to furnish every-one with a hat. Every one of us. Some designers strain to do things never done before, others make things that touch every one of us. Katty has a new website, about to launch. It shows her designs matched with this season's popular looks, you can instantly see how the hat adds something extra, quirky, personal, literally above what the original clothes designer's considered. When the site launches, the fashion world ought to beware, Katty has discovered a hither-to unexploited area: the top of our heads.